A great carpet cleaning company in Levittown, PA will have years of experience in the carpet cleaning business. It will have highly certified and trained technicians available to do the carpet cleaning for you. It will have a great guarantee, ensuring that you will be happy with the results. OxiGreen in Levittown, PA is just such a company. We have 25 years of experience in carpet cleaning and thousands of satisfied customers. Our carpet cleaning technicians are highly trained and certified by the IICRC, the Institute of Inspection, Cleaning and Restoration Certification, an independent entity that trains and certifies carpet cleaning technicians throughout the United States. We also have a great 100% guarantee. If for any reason you are not completely satisfied with the results, we will gladly come back and do it again for you. Furthermore, if any spots appear in your carpet within 30 days of our professional cleaning, we will come back and remove them for you, no questions asked. We are also happy to be able to say that we are a “green” carpet cleaning company, and we’re not referring to the color of your carpets! We use only biodegradable, eco-friendly carpet cleaning agents that are completely safe for the environment and, most importantly, for your family! No harsh chemicals are used that would damage your carpet fibers. No toxic residue will ever be left behind, residue that could threaten the health of your family members, especially your small children and pets. 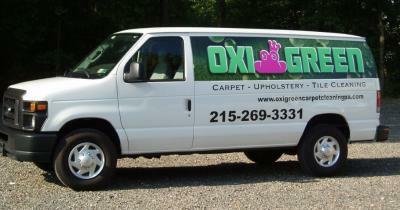 Call OxiGreen in Levittown today at 215-269-3331. We will be happy to answer your questions and schedule a free in-home carpet inspection for you. You can also visit our website to learn more about our company and the other services we provide, including tile and grout cleaning and upholstery cleaning.